Rocker Jack White, pro ballplayer Ian Kinsler, and Lake Highlander Ben Jenkins are opening a Deep Ellum HQ for their baseball bat company. Baseball has long been our most romantic sport. The game, once described by writer Michael Chabon as a “great slow contraption for getting you to pay attention to the cadence of a summer day,” lends itself to mythologizing. All the cold sabermetrics in the world can’t bust the magical allure of Babe Ruth calling his shot, or the awe-inspiring craziness of Dock Ellis’ acid-fueled no-hitter, or any of the other curses and superstitions and legends that have piled up around America’s pastime over the last century and change. So you’ll allow Ben Jenkins to get abstract, even poetic, when he talks about Warstic, the baseball bat and sports apparel company he founded in 2011 and is now moving into a 7,000-square-foot Deep Ellum brick-and-mortar that will feature a shop, showroom, and batting cage. That kind of talk is, after all, what convinced Jack White—the aesthetically minded rocker who first came to fame in the duo The White Stripes—and Ian Kinsler—the Los Angeles Angels second baseman who used to play for the Detroit Tigers and the Texas Rangers—to become partners and investors in the company in 2016. 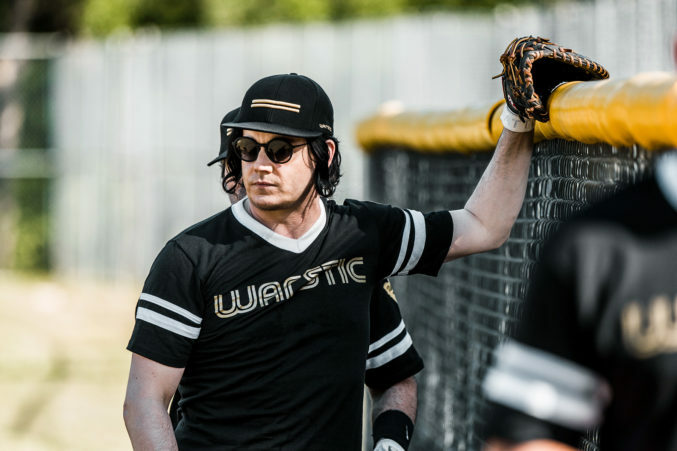 Jack White playing a sandlot game at Uptown’s Reverchon Park between April tour dates at The Bomb Factory. The metal and wooden baseball bats—bold, distinctive, and expensive, coming in a Crayola variety of colors and emblazoned with a minimalist two-stripe logo—are not just “weapons.” They’re works of art, as fit to be swung over home plate as they are to be hung in a bedroom or record store. And beyond the bats themselves, the company must represent something more, or else Pearl Jam frontman Eddie Vedder wouldn’t be wearing a Warstic t-shirt in concert, would he? Jenkins, who hopes to use the new storefront to host lectures from baseball notables, sports psychologists, and others, thinks it’s a hand-crafted, deliberative attitude that hearkens back to an era before modern marketing swallowed so much of our leisure time. Like baseball itself, Warstic requires you to slow down and pay attention. “If it was just me making pretty bats, (Warstic) didn’t have legs to go anywhere else,” Jenkins says. Being pretty didn’t hurt. White, along with being a noted baseball fan, has a predilection for strong color schemes. The self-mythologizing bluesman, sharing Warstic’s analog approach and appreciation for vintage objects, has designed his own limited-edition line of maple bats for the company. He helped promote Warstic when he was in Dallas for a pair of shows in April, taking the time to play a sandlot game at Reverchon Park with hosts from the sports radio station The Ticket. The temporary showroom at Warstic’s headquarters in Deep Ellum. Kinsler, for his part, has been using Warstic at bat and singing its praises to clubmates. Professional baseball players are, as noted above, a superstitious bunch, especially when it comes to bats, but he’s found some new Major League adherents, including Angels outfielder Justin Upton. Kinsler and Jenkins describe an athlete coming into the store, trying out a custom-made bat “like you’re being fitted for a suit.” “There’s no other bat company doing this, that’s for sure,” Kinsler says. The trio shares ambitious plans for the space, although some of their hopes for the new Warstic HQ sound like longer shots than others, even back in the planning stages in October. There was discussion at one point of transforming the basement into a private speakeasy for the partners and their heavy-hitting clients, and knocking down a wall to uncover what Jenkins thinks may be a long abandoned trolley line. Others, however, are already coming to life. 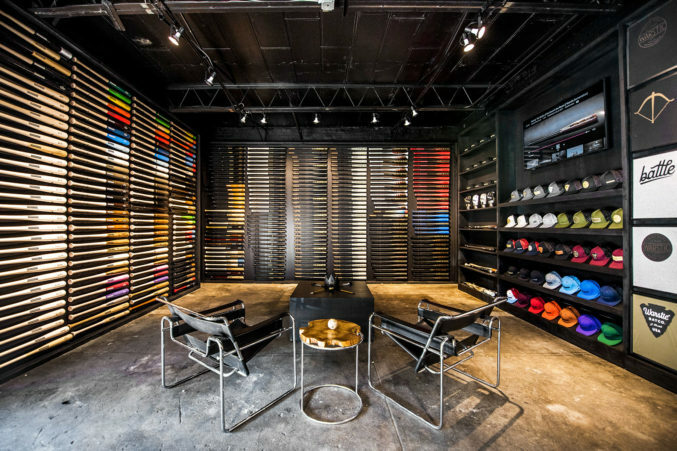 By late April, a 1,500-square-foot temporary showroom had been opened, and patrons could sample the wares by stepping into a temporary demo area with a tee and net. With the rest coming in phases, Jenkins would like to see the shop finished this fall. Eventually, a bar and restaurant on the roof, with a view of the batting cage. Maybe you come in off the street, have a cold beer, observe the cadence of a hot summer afternoon, watch swing after swing, serene. You don’t have to be a ballplayer to appreciate the romance of that.